Maybe I've just got James Robinson's writing on the brain (see Justice League: Cry for Justice), but there seems a clear demarkation in Superman: New Krypton Vol. 4 between those issues written by Robinson and those written by Greg Rucka. Granted both aspects are enjoyable; unfortunately, I felt this volume wastes much of its built-up capital with a lackluster ending only in service of getting the reader to buy the next book after. New Krypton Vol. 4 is two things: a collection of team-ups in the classic tradition between Superman and some of DC Comics' space heroes, and also the continuing story of political strife on New Krypton. While the two writers might say they plotted the stories together, the former seems much more Robinson's speed and the latter much more Rucka's. I find the politics more interesting, but it's definitely the book's "B" plot. Much more time is spent on Superman and the Kryptonians interacting with Jemm, Son of Saturn, and a group of random Thanagarians. To some extent, this goes toward Superman teaching his fellow Kryptonians about diplomacy rather than warfare. Given, however, that Jemm nor the Thanagarians nor even guest star Adam Strange have anything to do with this book's conclusion, I felt a sense that this book spun its wheels waiting for the next big event in the Superman titles overall rather than contained much of substance. It's unfortunate, because aside from their feeling like filler, I liked these team-ups quite a lot. In the kinder, gentler post-Infinite Crisis DC Universe, where much of the Justice League's history is restored, Superman and Adam Strange pal around like old friends, with Strange even calling Superman "Clark" -- there's a Silver Age charm to this. And I'm generally unfamiliar with Jemm, so it was interesting to see Superman calming the alien and referring to their shared history. The thematic turn of New Krypton Vol. 4, versus the previous volume, is that Superman becomes general of the Kryptonian military in this volume, leading rather than serving under General Zod. This causes not quite as many moral dilemmas as we saw in the last book, but there's still some good tension in Superman trying to convince the ruling council of his loyalty to Krypton. In particular, this volume brings to a head the ongoing story of Superman trying to get equal rights for Krypton's "untouchable" Labor Guild. Robinson and Rucka had cleverly set up young laborer Tyr-Van as Superman's Jimmy Olsen on New Krypton (going so far as to have Superman call Tyr "pal"), but in a moving scene, Superman realizes Tyr betrayed him for Zod, and breaks ties with his friend. Superman reconciles with Tyr in part later on, but the writers' sentiment was clear that even though New Krypton might sometimes look and sound like home to Superman, even with its own Jimmy Olsen, it's still a foreign planet. And then the book ends, far too uncertainly. New Krypton's conflict has always been between Superman and Zod; we get a sense that Zod is behind some of the planet's troubles, but the truth remains unclear. Superman feels he hasn't done enough for Krypton and Zod disagrees, but then there's not that additional beat to tell us what Superman has learned or what the story means thematically. Rather, there's the deus ex machina of an un-foreshadowed alien attack, and the story is continued in another book. The end. Now, New Krypton Vol. 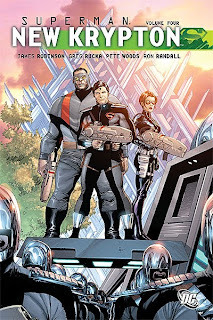 3 ended on a cliffhanger, too, that continued into Codename Patriot -- but volume 3 wasn't the end of the twelve-issue World of New Krypton miniseries, volume 4 is. Yes, it's all an ongoing story, but (maybe expressing some of my frustration with Cry for Justice) there's something about a miniseries that I feel, if it's a finite series, there ought be a finite ending. Let a book end like a book, and let the next series do the work of hearkening back. Nothing worse than getting to the end, and then not finding an end to get to. The fourth and final volume of New Krypton (if not the last part of the "New Krypton" storyline) has plenty of bright spots, especially if you like DC Comics' alien tapestry, but it's not the strongest of the volumes. This has been a long series, and we're in to the payoff now -- fingers crossed and here's hoping. I bought this a couple of week ago and sat down and read through all the NK trades. I am getting a little fatigued; but overall I did enjoy the read. I like what Robinson is doing, exploring Supes as a regular person among the kryptonians, you can really get to the inner character when he is no one special anymore because there's 100,000 "supermen." He's not unique anymore. I just can't wait till this is finally all out in trade. Hurry up DC, War of the Superman ended two months ago. I have thought that, some years from now, I'll sit down and read the whole New Krypton saga all the way through. It's impressive in its scope -- if you consider books like Superman: Last Son, then this storyline has been going on almost nonstop since Infinite Crisis; the same is true for the current Batman saga, too. It's just unfortunate New Krypton hasn't really grabbed the public consciousness nor did it tie in to any really large DC event; it's ended up being "just" a Superman story, though a good one, but not an event like Blackest Night. The good news is that the entire Last Stand of New Krypton mega-cross-over storyline and its aftermath are the overall highlight of the entire run. I think you'll both be pleasantly surprised by it. I've read that the NK ending didn't bode well with fans but I am looking forward to it. I've enjoyed it for the most part; CE, I am also looking forward to having the whole collection so I can sit down one day and read it all together. I'm actually happy this was contained to just the super books. I think WONK could of just been done in one of the super books rather than have the mini. You probably could of combined the Mon-el and N&F trades into one. I feel that the event was rather decently handled.From someone who needs to buy all the trades connected in the event,that's saying something.It's still a lot of books,none of which are peripheral....you eventually need to buy SUPERGIRL,MON-EL,NIGHTWING & FLAMEBIRD,CODENAME PATRIOT but the payoff was decent at least till the end of NK per se....yet to read LAST STAND & WAR OF THE SUPERMEN.Just a thought,but would have loved SUPERGIRL to come out in HC to balance all collections. That HQ suggests the best is yet to come in New Krypton gives me a lot of hope; I'm excited for it. At the same time, it sure looks like J. Michael Straczynski is having a heap of trouble with his new DC work, isn't he? His Brave and the Bold went over very well, but there's outcry over the new Wonder Woman direction, and Superman #701 didn't get very good reviews. I am glad to see a more Earth-bound Superman, but neither the post-event Superman nor Batman plans have really jumped out at me yet. Just a heads-up, I think this review is mistitled in the sidebar as "Superman: New Krypton" without a volume number. It's a great review, but hard to find! Hey thanks. I have fixed this.